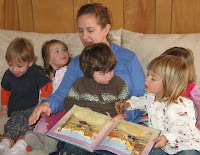 Storytelling with Toddlers - Joyful Toddlers! I love telling stories to toddlers. Although I enjoy reading stories to toddlers as well, I find the act of telling a story much different from reading one. Reading a storybook is a nice cuddly activity, where children snuggle up with me on the couch and we look at the pictures together, and talk about what’s going on (I rarely read the words). This is a great activity to do when the kids are tired and grouchy, or when they’re wound up and need something to help them calm down. Telling a story, on the other hand, is a much different experience: I tell it from memory. I use the same words or very similar words each time. The children are watching me instead of looking at a picture. And these are the stories that show up in the children’s play again and again. They are alive for the children in a way that picturebook stories never are. The age of the group determines where I tell the story: if I have a group of one- and two-year-olds, I’ll usually tell the story at the lunch table. I’ll wait until the older children (who usually eat much faster than the little ones) start to finish up. I’ll start a story, and the big ones sit and listen to me, while the little ones have all the time they need to eat as slowly as they do. Then we can all end the meal at the same time. For groups of older toddlers (two- and three-year-olds), I will tell simpler stories at the table, but save my real storytelling juice for either a puppet show (often done very simply on my lap) or acted out in our circle. Or I’ll start a new story at the table, and tell it pretty much every day for several weeks. Then I’ll take the story and do it as a puppet show or as a circle for several more weeks. I only change stories about once a month at the earliest; when I had only one- and two-year-olds, I would tell the same story for two to three months before changing. If the idea of memorizing a story is scary for you, don’t worry: toddlers are VERY forgiving! The more times you tell the story, the more regular the words will get for you. I’ve often started telling a story just trying to remember it from my own childhood, and over several days or even a week the words and cadences will cement themselves together. There are two types of stories that go over really well with toddlers. The first are nature stories, and the second are simple fairy tales. Nature stories are simple stories about woodland creatures that the children might find in their backyards. In the fall I tell one of the animals telling what they’re grateful for (at Thanksgiving time), as winter comes I have a story of a mouse finding a warm home for the winter in a pumpkin. In the spring I tell the story of the caterpillar becoming a butterfly. A wonderful source for these stories is Suzanne Down of Juniper Tree puppets. She taught the puppetry portion of my LifeWays training in Wisconsin, and now is the organizer of the Rocky Mountain LifeWays training in Boulder, CO. She is a wonderful resource! You can check out her website at http://junipertreepuppets.com/ . She puts out a newsletter periodically that always has one of these simple nature stories that’s appropriate for the season, with instructions on how to make simple table-puppets or lap-puppets if you wish to do it as a puppet show. The second type of story that toddlers love are fairy tales that have lots of repetition in them: The Three Little Pigs is my all-time most successful story, and is a great one to start with if you have never told a story before. You can even tell the Three Little Pigs for a month, then tell another story for a month, then tell the Three Little Pigs again. The children never tire of it; I am the only one who tires of it! Goldilocks and the Three Bears is a good one, but very long. If I can see that the children can’t sit all the way through, I will truncate the part where the bears go through each activity and discover the destruction that Goldilocks has wrought. However, if I do it as a puppet show they can almost always sit through it. If I have a bit of an older toddler crowd, I will tell The Elves and the Shoemaker after Christmas. Once upon a time, there was a little girl who lived with her mother. They were very poor, and one day the mother called her daughter to her. “Take these coins to market and get as much food as you can; when it is gone, we will have nothing left.” So the little girl went through the forest to the market and bought some apples and some bread. As she was walking home, she came upon an old woman sitting by the side of the path. “Please share your apples with me,” said the old woman, “For I am very hungry.” The little girl was hungry too, and it was all they had! But when she looked at the old woman her heart was moved. “Of course I will share what I have with you,” she said, and she gave the old woman some of her apples and her bread. “Thank you,” said the old woman. “Because you were so kind, and you shared when you had so little, I would like to give you this magic pot. Simply put it on the stove and say, “Please cook, little pot, please cook,” and it will cook sweet porridge which you can eat to your heart’s content. Then when you’ve had enough, simply say, “Please stop, little pot, please stop,” and you can put it away until you’re hungry again. The little girl ran home and showed the pot to her mother, who was overjoyed. Whenever they were hungry, the little girl would put the pot on the stove and say, “Please cook, little pot, please cook,” and they would eat sweet porridge to their hearts’ content. When they’d had enough, she’d say, “Please stop, little pot, please stop,” and they would put it away until they were hungry again. They lived happily this way for some time, but in the mother’s heart a desire grew to show off their new possession to their neighbors, to lord it over them that she had such a pot and they did not. One day when the little girl had gone to town, the mother called all of her neighbors over. She offered to feed them, not out of kindness, but out of pride. “Look what I have,” she said. She took out the pot and said, “Please cook little pot, please cook,” and the pot began to cook sweet porridge. The neighbors were amazed, and they ate the sweet porridge to their hearts’ content. But when they had eaten enough and were ready to be done, the mother forgot the words. She went to the pot and said,“Stop little pot, stop!” But do you think the pot stopped? No! It began to boil over the sides of the pot and onto the stove. The mother said, “Little pot, stop right now!” But do you think the pot stopped? No! The porridge began to boil off the stove and across the kitchen floor. The mother said, “Pot, stop-stop-stop-stop!” But do you think the pot stopped? No! It boiled out the door of the house and started going down the path. By the time the little girl came home, the porridge had filled every house in the town but one! The little girl ran home and said, “Please stop little pot, please stop,” and it did. But anyone who wanted to leave their house and go through the woods had to eat their way through the porridge. If you have any questions or comments about storytelling with toddlers, don’t hesitate to put it in the comments; others will surely appreciate it! can you please recommend a good source (online or in book form) of a place to go for simple, short fairy tales like the one you have in this post? I am looking for tales for the 1 to 2 month crowd. My best source has always been my mother's copy of The Complete Grimm's Fairy Tales. It has hundreds of tales, and you can see at a glance which ones are short. You can buy it on Amazon for about $13 new and much cheaper used. I tried looking around for good online sources, but mostly you can't see how long or short they're going to be, and many fairy tales are very long and complex. Does anyone else have a good online source of simple fairy tales? would you mind sharing which book you have exactly? i am looking on amazon and have found many books that say “complete grimes” but none have any of the stories you mentioned. thank you. Hmmm…I’m sorry to say I’m not sure which publisher/edition it is, and my books are all packed up in Colorado while I’m in London. Does anyone else have a copy with those stories? Mainlesson.com has a plethora of stories available for free. I am confused though as to why you would need a fairy tale for an infant? Singing and nursery rhymes would be much more appropriate. Fairy tales are not suited for all ages either. Simple nature stories could be a wonderful substitute then. Our Grimms is about twenty years old and well loved. All great resources here. I am a big fan of mainlesson.com for nature stories too as wells as Mary Thiennes Schunmann, all her books are fantastic for finding songs and ideas for the wee ones. Lullabyes too for the infants. Great post, Faith! Do you recommend the book “Spindrift”? I’ve heard it has good fairy tales for the littles. I’ve seen “Spindrift” sitting on my mom’s bookshelf, but I’ve never read it. If you get it, let us know how it is! Has anyone else read it? Author of Creative play with your Toddler. I’ve used the Wynstones books for about six years now and find them unparalleled in their song and text quality, singability, and variety. They celebrate the seasons so completely and beautifully, I’d be lost without these books! I am a musician myself, and quite picky about quality text and music as to what truly creates a powerful inner image, and I cannot recommend these books highly enough. I’ve used everything in them – verse, song, and story. I’ve used their longer stories in a therapeutic setting for ‘acting out’ and painting afterwards – wondrous! Thanks for sharing this, Joanna!